Corporate Groups & Meetings at Glandyfi Castle01654 781238work Meeting RoomThe large glazed courtyard easily seats 45 people for meetings and private functions. This light, airy venue is popular with local businesses who want an interesting venue for corporate meetings and presentations. Buffet style lunches or traditional teas can be provided in either the dining room or the glazed courtyard. The 45 acre site make this an ideal venue for team building days. Whether organisations wish to arrange their own team building programme or join in with local activities in the vicinity, there is always plenty to do. For smaller groups of professionals who desire absolute privacy in order to either team build or regroup, the castle is the perfect venue. Booked exclusively, groups can be sure that they will not be disturbed. All meals/refreshments can be arranged to fit in with group requirements. The castle prides itself upon its ability to offer a bespoke and discrete service suited to the needs of individual groups. Our strength lies in attention to detail and being empathetic to the needs of our guests.This luxurious historic building has Wi-Fi in all rooms. The large glazed courtyard easily seats 45 people for meetings and private functions. This light, airy venue is popular with local businesses who want an interesting venue for corporate meetings and presentations. Buffet style lunches or traditional teas can be provided in either the dining room or the glazed courtyard. Glandyfi Castle is ideal for groups of up to 8 couples ( 16 individuals) who wish to stay and have the exclusive use of a large country house. They can enjoy unlimited access to all public areas and the extensive grounds whilst enjoying the pleasures of fine food and relaxed luxury. 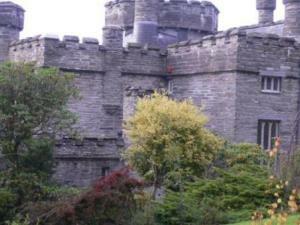 The privacy of the grounds make the Castle an ideal choice for those wishing to escape.